I’ve been playing more and more with in camera motion (i.e. panning the camera or zooming during a longer exposure). 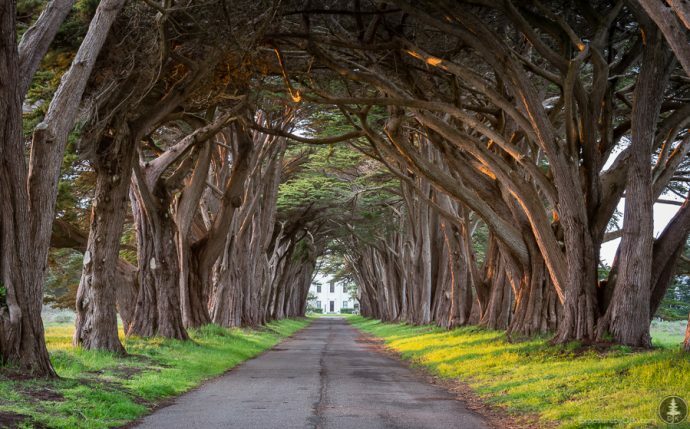 It started as something I’d do when objective “A” fell through or I was feeling restless, and now I sometimes find myself seeing scenes that work well with it, like this tunnel of trees at Point Reyes, north of San Francisco. Cypress trees and the RCA building, Point Reyes (North of San Francisco). It’s a frequently photographed spot and I wanted to try something different. Plus, the sunset was very short due to cloud cover (the light in the picture above lasted about 1 minute). Given the tunnel shape and colors, I thought a zoom effect would work well, and the building at the end (a historic RCA building used to communicate to ships far out at sea) gave it a nice focus point. To get the shot, I took two images: one while zooming (4 second exposure) and one zoomed in on the door. (at the end of the zoom range for the 4 s shot). I aligned the door in the center so all the motion blur lines would point to it and the door would largely stay in one place. The door was actually fairly sharp on the zooming photo, but to make it clearer, I took both pictures into PS and added a mask on the zoomed photo to reveal the sharp door underneath. I used a fairly soft brush to each the transition around the door. Other than that, pretty minimal corrections save for cropping the bottom part of the photo to remove some dirt and road. 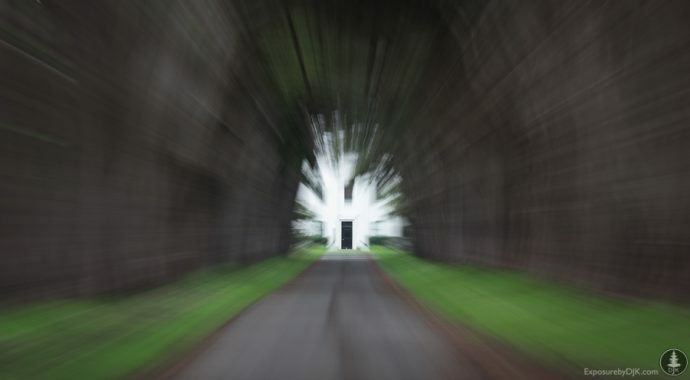 Same Cypress tunnel while zooming the camera lens during a longer exposure. You can move the entire camera (this works well on a train or in a car, for instance) or you can zoom with the lens. For the latter, a tripod is preferred as hand holding can create additional motion lines and detract from the main direction of the blur (of course, this can create some cool effects too!). You’ll need a longer shutter speed, so low light is often helpful (the shot above was done just after sunset). A neutral density filter and/or smaller apertures can also help. There is no “right” shutter speed. One to four seconds is common for me, but experiment! When taking a photo while zooming, start zooming before triggering the shutter and keep going all the way through. This will keep it nice and smooth without the motion lines being jagged, or weird start/stop jaggedness. You can also do similar effects in post via Photoshop, but I’d rather play while outside that behind my computer! How else have you used motion in your photography?